Hillside and art are synonymous with each other. The Rooms, Brasserie, Apartments and Bistro house a fine collection of contemporary art to be enjoyed freely by the guests as part of the whole experience of Hillside which is about presence. Art inspires conversation, especially combined with good food, delicious wine and a relaxing environment. The collection of art is mainly of contemporary Scandinavian paintings and sculptures, but more recently, since the opening of Hillside Bistro in April 2012, includes paintings by local artists and from further afield. Hillside Bistro had a direct connection with the artists, who were invited to show their work. Each artist had a 'Meet the Artist' day or two to which the public were invited to join the artist for a drink and a dialogue while viewing the artwork. Dates and times for these was in the Art News section on the website in advance. Most of the paintings in each exhibition was for sale, a price list was available on request. All sales were made directly with the artist and not through the Bistro, so no commission is involved. This enabled the buyer and artist to build a relationship. The constantly changing art is not only good for the visitors but also for the artists and as the collection of both art and artists expands, Hillside will become a great meeting place for those who enjoy the experience of good art, food and wine and of course good conversation. Just as the art is constantly changing in the Bistro, so is collection of art at Hillside and Apartments. Not only the linen is changed - the art as well. The paintings at Hillside and Apartments are all part of a private collection and they enjoy being moved around and being seen by lovely guests. We often say they are the luckiest paintings. 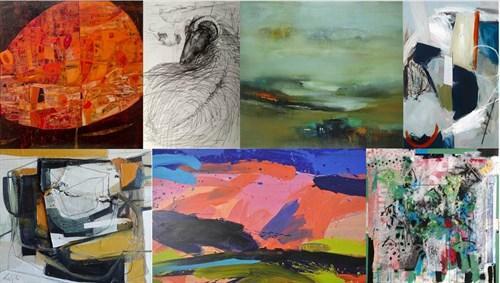 Hillside had a fantastic group of artists in 2012, 2013, 2014 and is very much look forward to the new session of shows. For a full list of the Hillside artists and for further information about them see below.